The storytelling shows real flair, conjuring up the personal history of a man who shrouded his truths from those closest to him. Lorena Weaver’s multigenerational saga Runaway Ray is a full-bodied novel that draws upon a captivating family history, relying on imagination to fill in gaps. The novel chronicles the life of Evan Raymond Titus, who loses his father to lead poisoning before he is born, endures the abuse of a cruel stepfather, and strikes out on his own in hope of a better life. 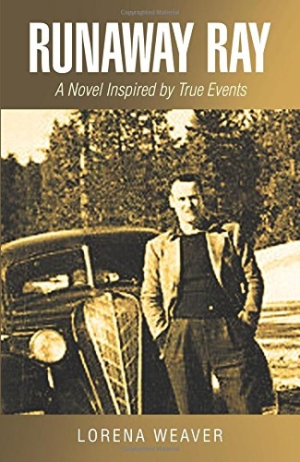 The boy from small-town Idaho becomes a bootlegger for the mafia in Los Angeles, evading both cops and robbers, and developing a fondness for booze. He goes on to start three families and father eleven children across the country. Titus never tells his wives and children about his past. He treats them well when he’s around and does regret leaving them, but he suffers from impulsiveness, a worsening drinking problem, and childhood trauma that he just can’t shake. The book is based on true events; the author is one of Titus’s children. This dramatization draws from extensive research, including black-and-white family photos, marriage certificates, and other documents to paint a complex, nuanced portrait of a loving, kind, and well-meaning man who kept secrets and made poor decisions that forever changed his life. Though he would be easy to caricature and demonize, Titus is presented as a dimensional human being who is, to some extent, a victim of his circumstances. This empathetic portrait includes his flaws and foibles. The book particularly excels at sketching out supporting characters and documenting all the damage Titus leaves in his wake. It vividly renders how his wives were wracked with anxiety after he left, how his families ended up mired in poverty, and how one wife was hurt enough to try to track him down by using a professional investigator. It painfully details how his abandoned families had to live in squalor in filthy apartment buildings, get him declared legally dead, apply for government aid, and work menial jobs to make ends meet. The novel hews to a straightforward chronological structure, with sections devoted to each of Ray’s three families. A foreword, prologue, afterword, and other supplementary sections explain the story behind the story, and how the book came to fruition. The storytelling shows real flair, conjuring up the personal history of a man who shrouded his truths from those closest to him. The plot flows, but the book still takes the time to explain the mindsets, motivations, and emotions of all its characters. Runaway Ray is the sad tale of an imperfect, desperate man who failed to be there for the ones who loved him most, but it is also an inspiring story about how his families survived and even thrived on their own.